Bach's six English Suites, of which this volume comprises the latter three, present something of a mystery in their composition. It is supposed that he wrote them prior to taking up his position in Leipzig, and academic research is increasingly tracing their origin to Bach's years at Weimar (1708-1714) when he was a young man. The music readily mixes French and Italian musical elements and styles with Bach's counterpoint. Nobody knows for sure why these are called English Suites, but the musical content has no relation to anything English. The harpsichord recordings of Fernando Valenti are regarded by many as some of the finest ever made. It is a mystery as to why these remarkable recordings have been unobtainable for so long, and we are grateful to Peter Harrison for his fine remastering of these recordings from original 1950s vinyl. Bach’s English Suites, possibly the earliest keyboard music by him that has survived, was also the earliest of his famed “six-packs.” By and large, it’s good music but not the best representation of either Bach’s inventiveness or the English style of Baroque harpsichord music. The late Fernando Valenti, who was encouraged to take up the harpsichord by the legendary Ralph Kirkpatrick, became something of a local New York legend for his annual performances of Bach and Scarlatti. 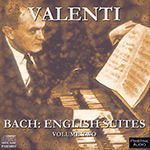 Pristine Classical has remastered all of his Scarlatti albums as well as this single disc of Bach works recorded in the early 1950s for Westminster (WL 5253). Judging from this release, Valenti’s fame seems to me overrated, but of course this is an early disc made during the infancy of the Baroque revival. The slow movements are too fast and glib, while the fast movements are too slow; there is an overall leadenness to the musical progression that I find stultifying. I much prefer the performances of Gustav Leonhardt, Christophe Rousset, even Andras Schiff or Anne-Marie McDermott on piano, to this one. As usual, Pristine Audio’s sonic renovations bring out tremendous fullness and clarity of sound while minimizing the original surface noise. This article originally appeared in Issue 31:4 (Mar/Apr 2008) of Fanfare Magazine.